Are the Tories really on course to beat Labour in Police Commissioner elections? Posted in Politics on August 12th, 2012 by Leo – Comments Off on Are the Tories really on course to beat Labour in Police Commissioner elections? ConservativeHome has stuck its neck out with an analysis of voting preferences for the November elections for Police and Crime Commissioners. Based on work by the Police Foundation, the article suggests that “even on the current discouraging opinion poll trends the Conservatives would end up winning the election of 21 commissioners against 20 for Labour”. The claim has been picked up by the Guardian. But such a high figure seems like an odd sort of reverse expectation management on the part of ConservativeHome – as if they have some anti-Cameron agenda. The first reason why the figure of 21 Tory Commissioners seems too high is that it is based on out-dated opinion poll data. Through no fault other than bad luck, the Police Foundation used data from February, when Labour’s average lead over the Tories was 1.5pts; the current UK Polling Report lead for Labour is 10pts. Given that Labour’s support, absolutely and relative to the Tories, is now several points higher than it was when the Police Foundation did their analysis, some of the marginals might now go the other way. The tightest ones projected in the Tory column are Avon and Somerset, Bedfordshire, Northamptonshire and Warwickshire, and the same calculation, repeated now, might put all of these in Labour’s side, depending on exactly which polls are used. 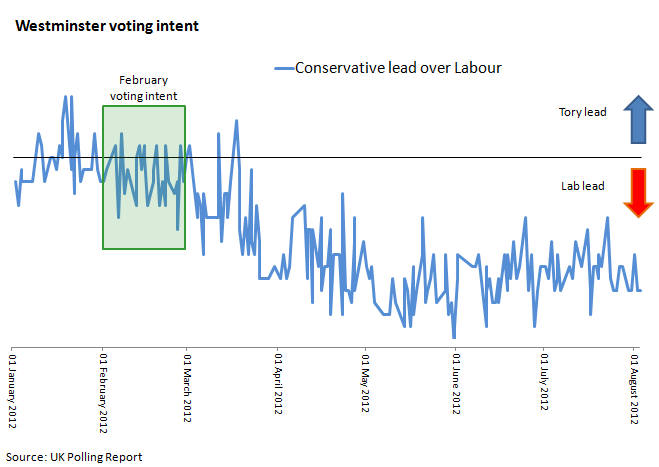 I’m not sure whether ConservativeHome missed this or chose to ignore it, but the suggestion that the analysis incorporates “current” polling isn’t correct. The second problem with the prediction of 21 Tory Commissioners is the unpredictability of the election. Turnout is one issue. Of course it will be low, but at the moment there’s no way of knowing whether this will affect one side more than another. There’s also the unpredictable impact of independent candidates. Plausible local campaigns could disrupt the Tory/Labour dominance, or they may just disappear without trace in an election that won’t get much national media coverage. The other unpredictable factor, which could be crucial, is how voters will see the election. It’s said in consultancy, “a junior analyst needs three data points to call it a trend, a director needs two points for a trend, and a VP just needs one point”. Whoever’s interpreting the data on the question of prioritising growth vs deficit reduction, it certainly now looks like a trend. 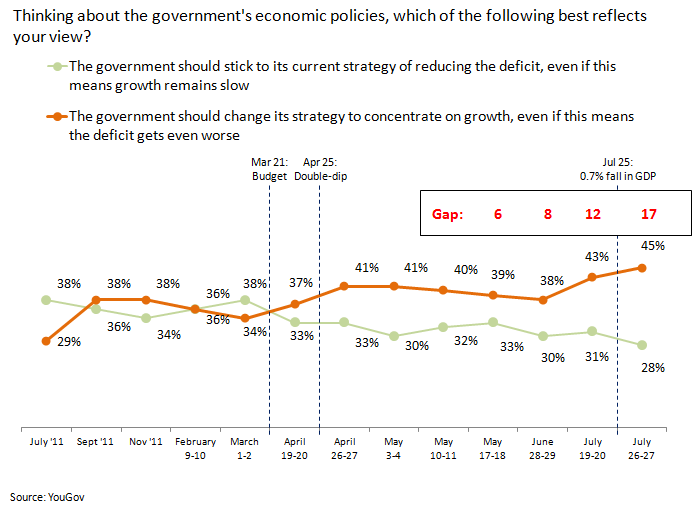 For the third consecutive poll, the gap has increased in favour of concentrating on growth, “even if this means the deficit gets worse”. If the government is to fight the next election with the argument that it’s been making tough but necessary decisions, it will have to reverse this trend.